I just downloaded ten four fox and opened the zip and dragged the icon into my applications folder. I don't know how to open it now or it just doens't work. 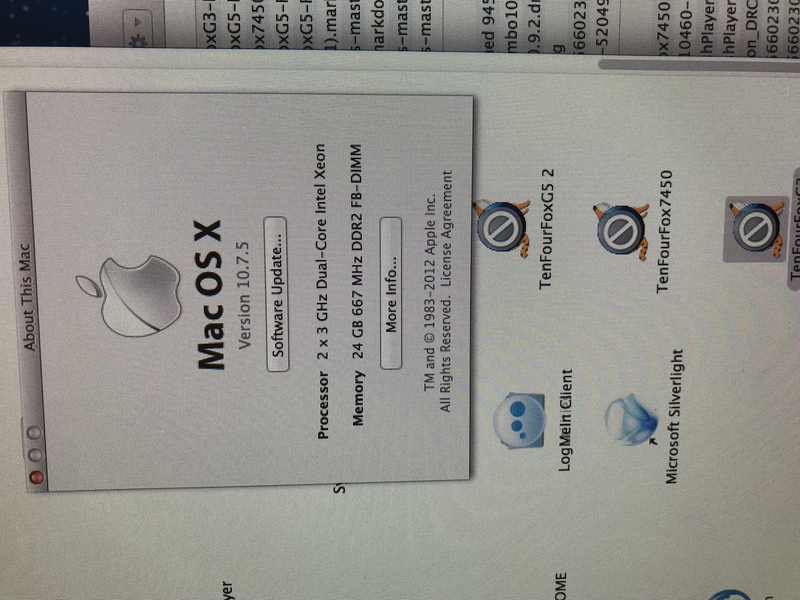 I have 10.4.11 and the processor is 2 x 2.66 SHz Dual-Core Intel Xeon. Do I have the right G5 for this? Hello Gregory, I'm sorry, you don't have the right Mac. TenFourFox is made for PPC Macs, and yours is a Mac (Pro?) with Intel processors. Or (not really recommended and unsupported) keep your Mac at 10.4 and download the G3 version of TenFourFox, which will run in Rosetta mode. oh I don't have the right mac? no wonder. Thank you. so I should download the G3 version? that will be ok? what does that mean it will run in the Rosetta mode? The reason I don't want to upgrade the OS is because it may mess up my Final Cut Pro files on the computer. Gregory, if you cannot update your OS, you can try the G3 version, it should run OK, but we don't support this. I.e., if it crashes or anything else doesn't work, there will be no help here. You should be aware that running 10.4/Intel is pretty much the least secure OS X setup imaginable when the Mac has internet access. You should consider using this Mac for Final Cut only and use another Mac for web browsing. Rosetta is a PPC emulator that Apple shipped with the Intel versions of 10.4 - 10.6. This means you can run software that was designed for the PPC architecture on your Intel Mac. However, this comes with a performance penalty, and not all PPC applications will work. Yah I’ll definitely try to the G3 version. I mean the internet still works fine and all…but you know I’m just having trouble RECENTLY viewing video on youtube that’s all. So if it crashes, then I can just go back to using the regular firefox, safari, etc I guess. What do you mean the least secure? You mean using the internet with 10.4.1? I just go on youtube, google searches. So I should just use this internet for just FCP? No internet at all? Ok cool so my cpu has Rosetta built into it then. Thanks Chris…I’ll download G3 version and see how it works. Yah these macs are pretty powerful and last so long…I will eventually get myself a mac pro laptop…no more desktops for me. Malware is usually compiled for Intel Macs (not PPC), and 10.4 hasn't received security updates for ages (Apple's now at 10.12.x), it doesn't have Apple's malware protection nor any of the modern security features introduced with 10.7 and after. Worst of all, there are no up-to-date web browsers for 10.4/Intel anymore (except, in a way, TenFourFox). The only way to make it secure is: no internet. Thanks Chris. What do you mean compiled? So you mean the 10.4 that I have today…it doesn’t have that security feature on it anymore? programming language to machine code. The latter is processor-specific, i.e. Hi - I've just tried to run tenfourfox on my G5 but I get the error message to say TenFourFoxG5-FPR6 can't open as its an unsupported architecture. I thought that this was intended to run on PowerPC...have I downloaded the wrong version ? Steve, the .zip file was either not downloaded completely or opened with a third-party unzip utility. Please try to re-download the .zip file, right-click, choose Open With… and then "Archive Utility" if you're on 10.5 or "BomArchiveHelper" if you're on 10.4. Many thanks Chris - you were correct : I'd opened the zip file with Zipeg, but once I used Archive Utility it worked fine. The browser looks great ! Every version I’ve tried says PowerPC no longer supported, is there any other options to help, I really don’t want to lose a perfectly good machine. this browser is intended for Power PC based macs, but yours is intel based. TenFourFox 17.0.2 will work on Intel Macs, but you'll need a Windows computer to successfully reach the sourcefourge repository to download onto a USB. Through that method, I got TFF 17.0.2 working on my Intel Mac running OSX 10.5.8.